The execution chamber in Huntsville, Texas. THE US STATE of Texas killed its sixth death row inmate of the year yesterday, prison officials said, after replenishing a lethal injection drug that some manufacturers have refused to sell for executions. Manuel Garza, 35, was declared dead by lethal injection at 6.40pm local time in the execution chamber in Huntsville, said Texas prisons spokesman Jason Clark. Garza was sentenced to death for killing a police officer in February 2001 with the officer’s own gun. This is the first execution carried out in Texas after the state restocked its supply of pentobarbital, a barbiturate that is included in the lethal injection cocktail used on death row. 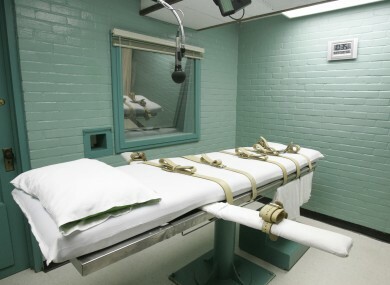 Some drugs companies have refused to sell the chemical to put death row inmates to death, and Texas came close to putting executions on hold until it was able to restock the drug. Other states are currently facing similar shortages. An anonymous manufacturer sold pentobarbital to the state, which carries out about one third of all death row executions in the country — the most out of any US state. Clark said the fresh supply of pentobarbital will allow the prison to carry out two more scheduled executions in April. There are three additional executions set to take place after April, but Clark did not say whether the prison had adequate drugs to carry those out. “We will be able to carry out executions that are scheduled for April with the new purchase,” Clark told AFP earlier. The US Supreme Court is due to consider the constitutionality of lethal injection — the most common form of execution in the United States, but one that has become increasingly controversial. In 2008, the court ruled that lethal injection was constitutional, but that was before recent shortages in the most commonly used drugs prompted state officials to come up with lethal medication cocktails that appeared to cause pain and suffering in inmates during some recent executions. This is the 13th execution of the year in the United States. Email “Texas executes sixth inmate this year after restocking lethal injection drug”. Feedback on “Texas executes sixth inmate this year after restocking lethal injection drug”.